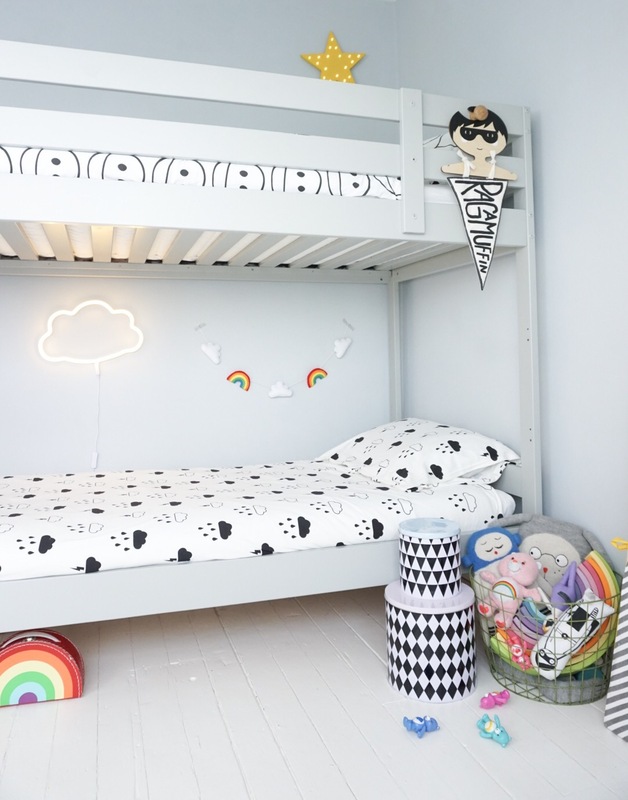 We’ve got our mitts on a beautiful Tobias and the Bear bedset from Hip Little People, and it’s amazing! The softest cotton jersey, which is ideal for Barney as he suffers from eczema and has really sensitive skin. 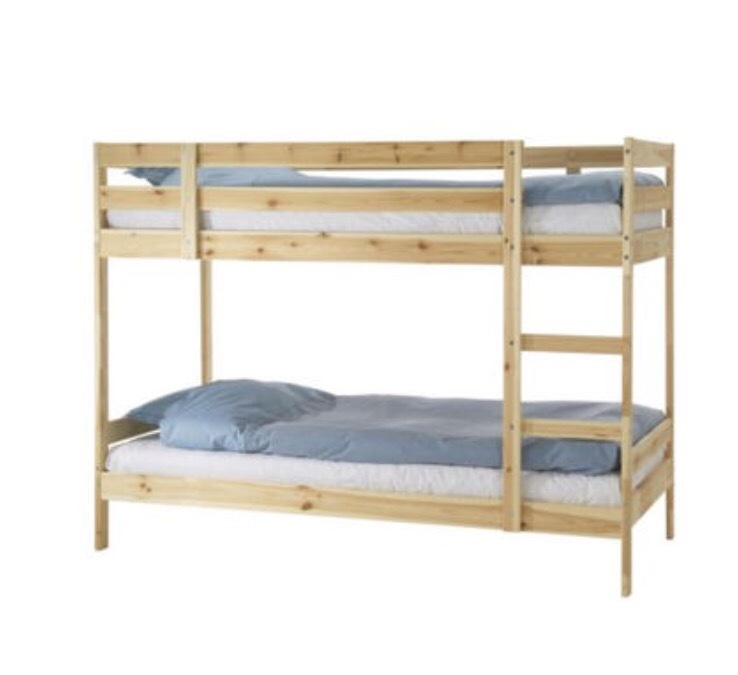 To show how wonderfully versatile it is, we’ve put together a few different looks incorporating it on our bunk bed. I’m often asked where the boy’s bed is from, and it’s just simple old Ikea Mydal at a bargain price which we’ve painted grey. 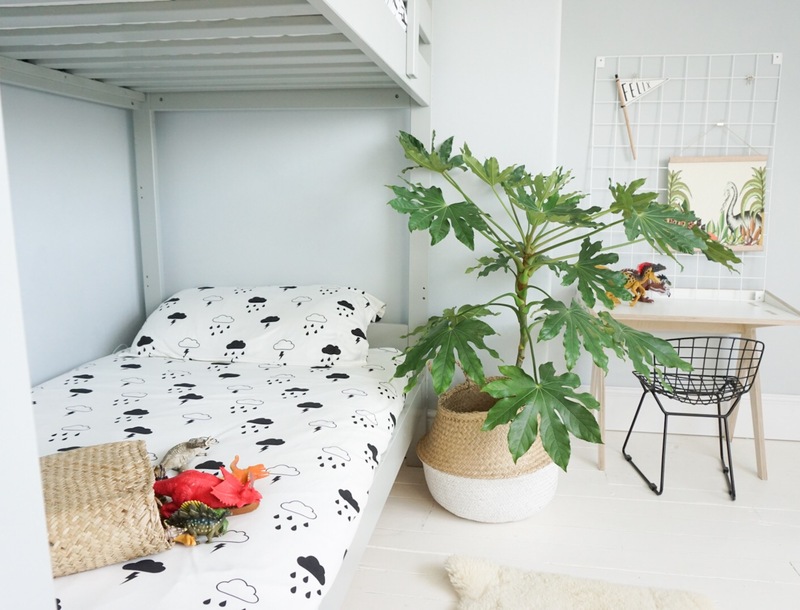 We were on a budget when we put the boys room together 2 years ago, and although I’d really like the Linus bunk bed from Made.com , the Ikea one has done us proud and has survived two small boys exceptionally well! 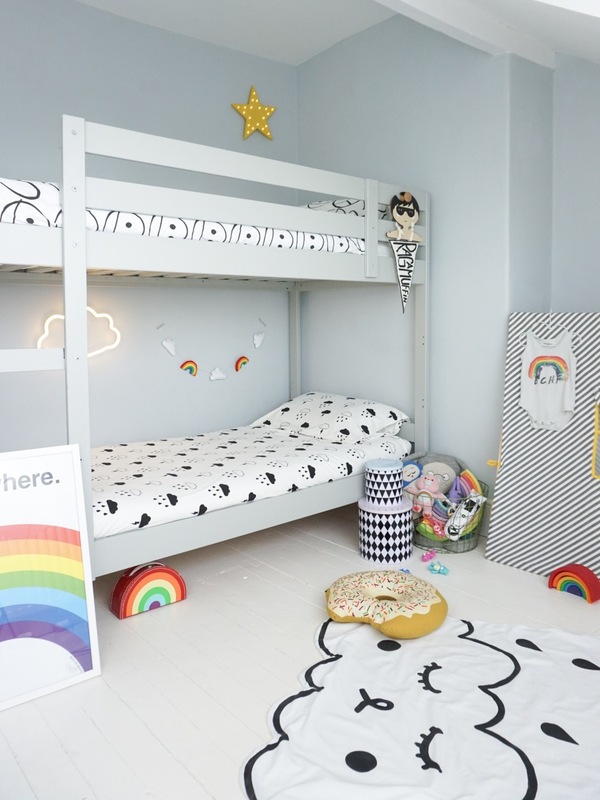 The storm cloud style naturally lends itself to the very dominant monochrome superhero children’s room theme which is so prevalent at the moment, and we created a look with a nod to that, but kept it fairly clean, though pops of colour could be introduced easily. 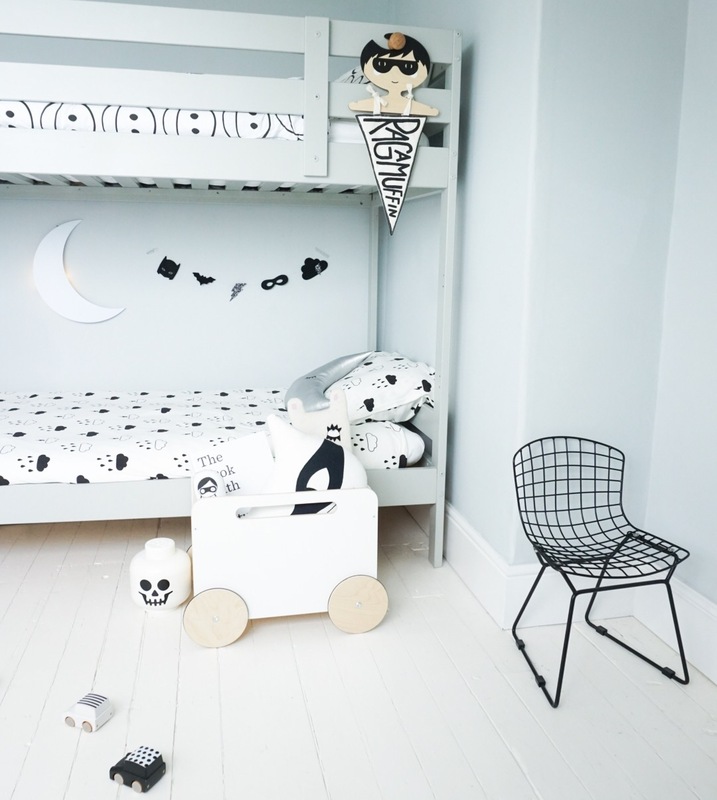 To create this look we used our Velveteen Babies Superhero garland, a crescent moon nightlight from Lights4Fun, toy storage box by OohNoo and a touch of silver with our crescent moon cushion from Marjorie Minnie. Mixing natural wood, with softer greys and silvers keeps the look fairly soft instead of harsh monochrome which we’ve moved on from. We used our My Red Hand Gang superhero hanger suspended on a wooded peg which we screwed into the bed frame, and hung a Roxy Marj pennant from it. Sadly, Roxy no longer makes these, but you can find lovely pennants from Inky Huckster and she’ll personalise with your own message. 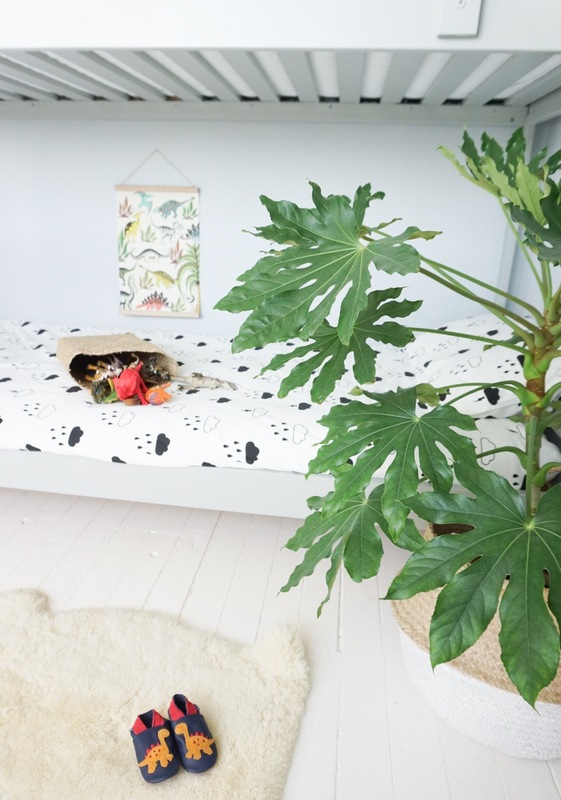 My children adore dinosaurs, but they are not always the most interior design friendly theme to source! Luckily I discovered the most brilliant prints from Dinoraw Kids. They are incredible and there’s a huge range on their website, and cushions too. They are based in Australia but ship worldwide, and they also have a couple of European stockists. I don’t like a strong room ‘theme’ so we’ve kept the look very natural, lots of raffia baskets for the toys, and a leafy green plant. I’d personally avoid trying to find a dinosaur bedding set as there’s nothing worse than overkill on a subject matter which is an easy mistake to make. Our desk is by Plyconic and has a metal grid noticeboard from This Modern Life. We’ve clipped another Dinoraw print onto it (many come ready framed so they are ready to go!). One of our big favourites with everyone is a gender neutral rainbow look. I hate too much clutter so we have just added accents of bright colour. 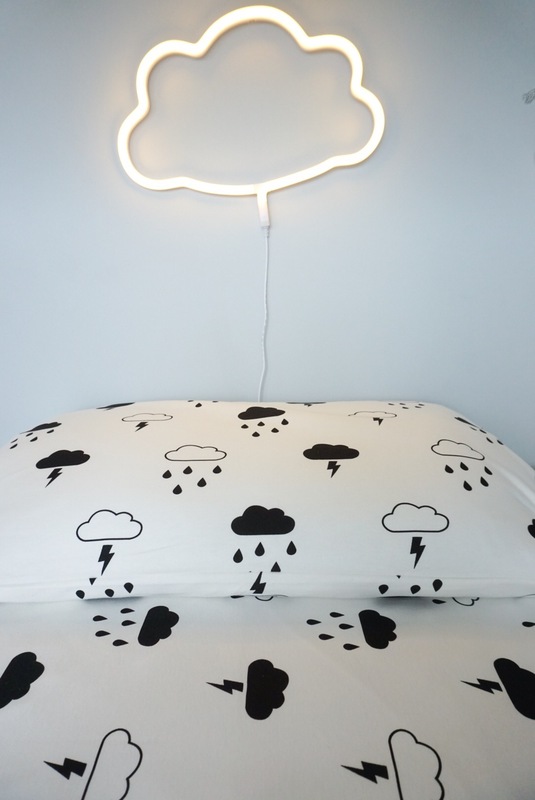 Our cloud neon light is from V and C designs, and rainbow garland from our webshop Velveteen Babies. 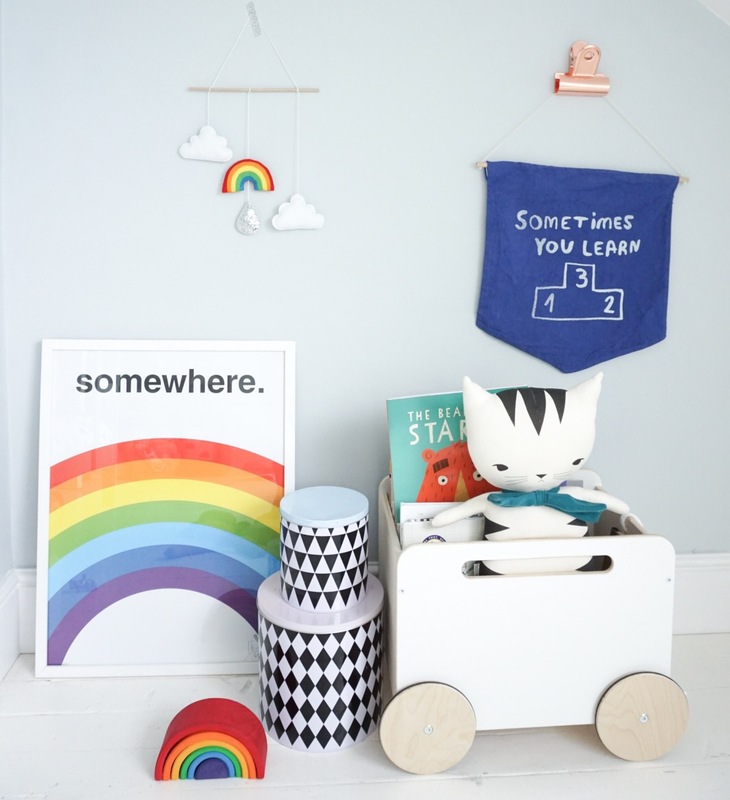 Toys can be stored in wire baskets and the ecelectic mix of colours simply lends itself to the theme- try wire storage baskets from Ferm Living to get the look. Keep bright accents looking their best against white and grey to balance it out. We have a Born n Monday playmat on the floor in the style of a rain cloud. Our final look is ‘a nod to nature’. My kids all adore finding out about the world, conservation and nature. It’s another completely genderless installation. Again we’ve used pieces from the other styles, the Ooh Noo toy trunk for our books which is incredibly useful. 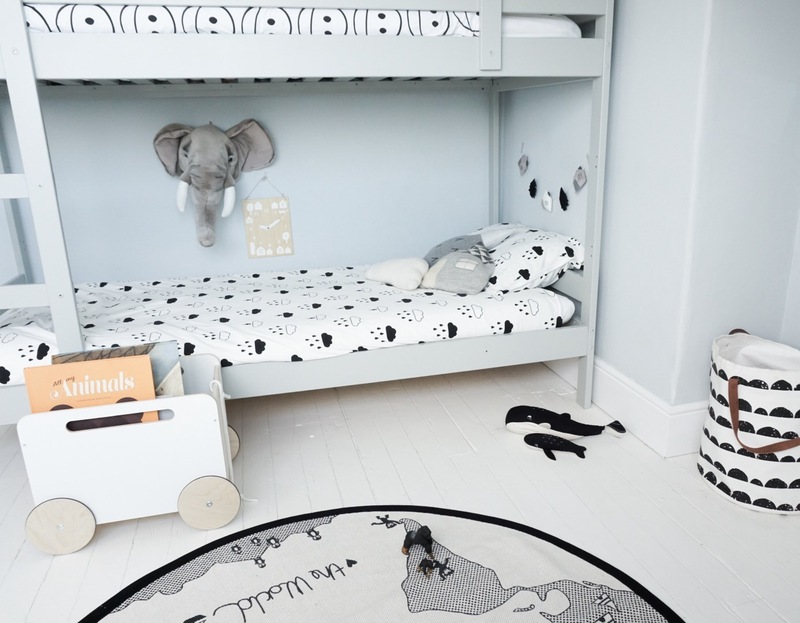 Our ‘world’ rug is by OYOY from Scandiborn and our whale toys by Talpathings on Etsy. 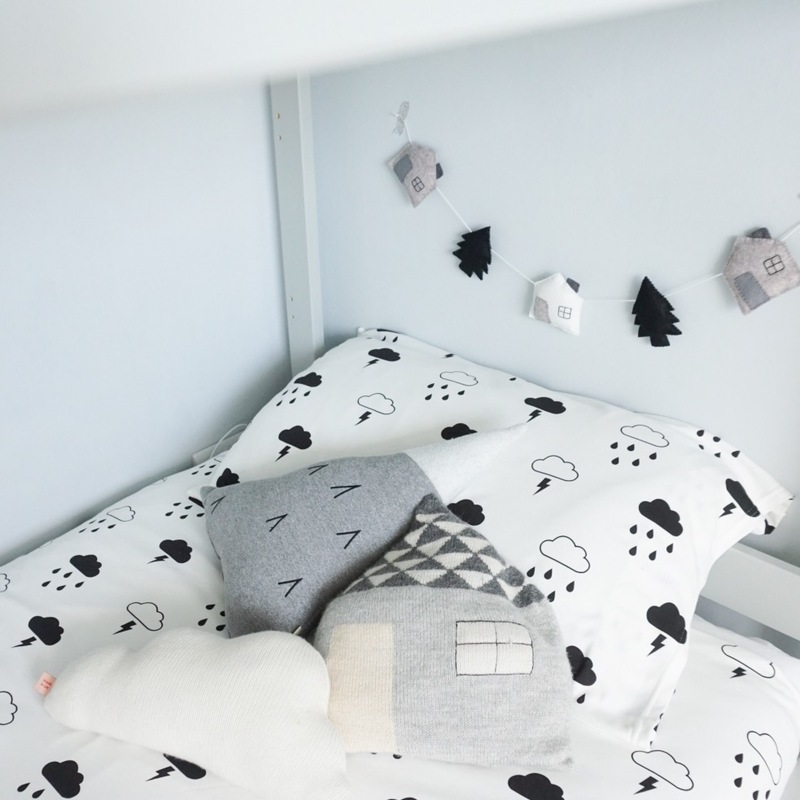 Monochrome toy storage is at its best and most useful in our Ferm Living fabric storage bags, and we’ve added more plywood accent to the wall with our toy wood clock from Muotokuja which was one of my weekly finds over on my Velveteen Babies Instagram page (@velveteen_babies ). Each week I like to share a small kids design business that I love, so if you search the hashtag #velveteenbabiesloves on Instagram you’ll discover some real interior treasures. 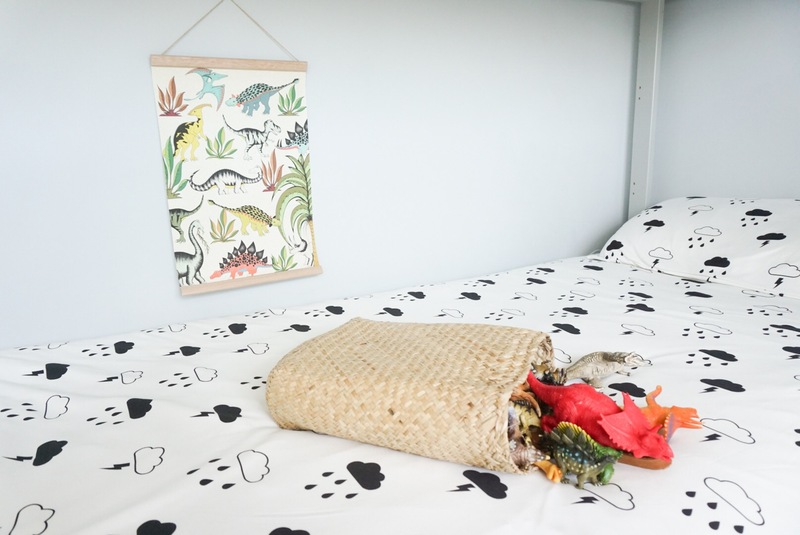 Bedding used throughout is from Hip Little People (there’s a few other gorgeous styles from the Tobias and the Bear collection and cot bed sizes too) as well as design led clothing and homewares on their site.